Greetings everyone! Many community members were concerned of whether they would ever get word on a Japanese tank that wasn't a Tier 1 or 2. Well, today Gaijin has answered your question, and now we get a look at Japan's first post war tank. I have written the devblog on this one (and will continue to), and have already written a previous article on its history. So, today's overview will be a tad shorter. Anyhow, let's take a deep look into one of Japan's first postwar tanks, the ST-A1. Many will notice how small the turret is. Yes, this is an error in the model. It'll most likely get changed for you by release. In the years following after the Second World War, the Japanese were heavily restricted in their military. They were limited to a Police Force in 1950, and by 1954 they were permitted to form a National Defense Force with the sole purpose of maintaining their borders without relying on the United States Military. This action was detailed and enacted through the U.S and Japan Mutual Defense Assistance Agreement. With the tensions between the Communist’s and the free world simmering up, the Japanese knew that at some point, they too would need their own tanks. Until then they had been using leased Sherman, Bulldog, and Chaffee tanks in their arsenal. A year after the Japanese Self Defense Force was formed, development on their first tank began with two vehicle requirements: one for a main battle tank and one for a tank destroyer. The tank destroyer was given the designation SS, and would eventually be produced as the Type60 Tank Destroyer, known for it’s twin recoilless rifles. The battle tank was designated ST-A (Short for Special Purpose Vehicle A), and was to use the M47 / M48's 90mm as inspiration for the design of the vehicle’s main armament. This became official in 1955, when the U.S Military and the Japanese agreed to aid one another in technological advancements. Originally, the design of the vehicle was to be 25t, but Japan soon understand that the tank needed to weigh in at least 30t to be given necessary armour protection. The contract to build the tank was licensed to Mitsubishi Heavy Industries, which had a large role in the manufacturing of tanks for the Imperial Japanese Army and Navy throughout the duration of World War 2. By October, both tank ideas were produced in mock-up form. The finalized weights they came to were 32t and 35t vehicles respectively. Despite the original requirement of a lightweight tank design, the General Staff Office were pleased with what Mitsubishi had shown, even though it had increased the final weight to 35 tons. Both designs were presented at the 5th Technical Council in 1955. The names given to these tanks were ST-AI and ST-AII. After the presentation, the JGSDF ordered a 32t prototype mock-up and further studies. The prototypes were completed in October of 1956. The weight of the ST-A1 was 34 tons, 8.59 meters long (6.6 meters body length), 2.9 meters wide, and 2.23 meters tall. The design of the tank emphasized its low silhouette. The ST-A1 followed the original order in this regard, as the Ground Staff Office wanted a tank low to the ground which would give anti-tank missiles a more difficult time getting a proper shot on the vehicle. However, this also meant that the vehicle could not traverse its turret fully to the rear without elevating the cannon. Hence, the length of the tank had to be extended to avoid further issues. The suspension wheels became narrower as the track length extended. This increased the ground pressure, which caused problems traversing. The tank's width was kept under 3 meters in order to properly fit on railway cars that would be used for ease of transportation. The transmission of the ST-A1 was designed to use an automatic style clutch with a torque converter. 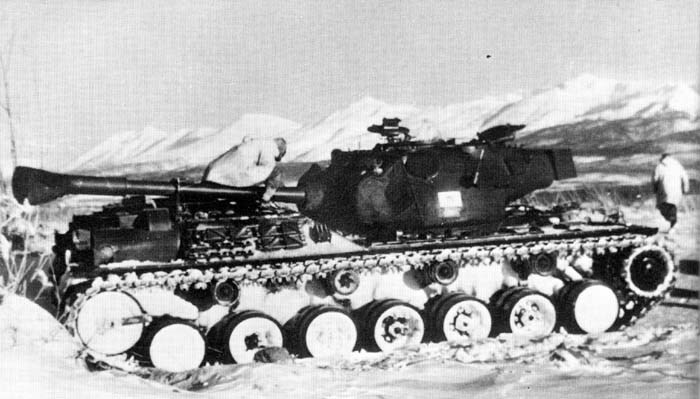 A power-steered rear wheel drive system connecting straight to the engine and transmission to the rear was also planned, like what other modern tanks in the West used. Overall, this design was not used on the prototype. There were no problems with technology that the Japanese SDF had, therefore they did not need parts that the U.S was using. Initially, the prototype ST-A1 introduced a two-stage torque converter manufactured by Sweden's SRM Company, however when it was installed, there were problems with power loss and agility, which was not a satisfying appearance to the Council and their requirements. Instead, a front wheel drive system and a constantly interchanged gear-style transmission were chosen. A normal manual transmission of the 5 forward and 1 reverse speed was used for the ST-A1 prototype. It had an air-cooled diesel engine and torsion bar suspension. The tank was to use a custom made engine, but due to an incoming deadline, the tank prototype mounted the Mitsubishi DL10T V12 liquid-cooled diesel engine with 500hp at 2,000rpm instead. The max speed of the tank on off-road terrain was 45kmh. The gun selection on the ST-A tanks was fairly straightforward. The Japanese wanted to use the American's new 90mm tank gun as the staple for these prototypes and for the production model as well. The Japanese were never able to obtain a license for the 90mm M3, however they were given permission to copy the design to the best of their own abilities. The 90mm Japan came up with was left unnamed until 1961 when the Type61 Main Battle Tank was serviced, to which then it became the Type61 90mm Anti Tank Cannon. By this point the cannon was given heavy modifications to the original one used on the prototype model. However the same name was applied accordingly. 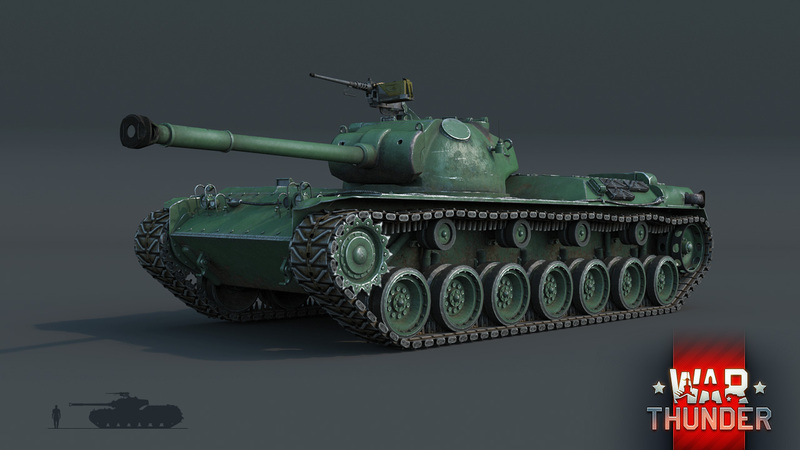 When the Soviet union released their new and modern T-54 tank, the Japanese Self Defense Force considered designing a larger 105mm cannon to deal with this tank. However, due to finances and time shortaging, the gun never left drawing boards. Instead, Japan focused on modernizing their 90mm. The cannon had a elevation of +13 degrees, which can be seen as poor for most Japanese tanks. However the depression of the cannon was capped at -10 degrees. The muzzle velocity of the cannon’s shells was 830m/s for high explosive shells and 910m/s for armor piercing shells. The cannon had a rate-of-fire of 10-15 shells per minute, and a maximum target range of 13,060 meters. Turret rotation speed was 24 degrees per second, and cannon elevation / depression was 4 degrees per second. In the end, the ST-A1 did not meet the proper requirements of the Ground Staff, and the ST-A2 was chosen for further development. However the ST-A1 represented the first time since the Second World War that Japan had designed and manufactured their own indigenous tank and presented it globally. I have written an article covering the entire story of the post war tank development in my prior article, Fresh Start, New Beginnings. The tank's detail are kept minimal, the story behind the other prototypes are where the history starts getting into the specifics. So this tank has around a 5 second reload rate? Oh boy this thing is gonna club hard, love it. What tank IG can we compare its mobility to? Hello! I guess that Gaijin had implemented the wrong model of turret on ST-A1. Сan you confirm or deny this, please show picture with the right perspective if you have it. "The max speed of the tank on off-road terrain was 45kmh". So what was the top speed on-road?